"Magick is not a path for followers; it is a path for questioners, seekers, and anyone who has trouble settling for dogma and pre-formulated answers. Magick is for those who feel the desire to peel away the surface of reality and see what lies beneath. Like various persecuted forms of mysticism, magick promotes direct contact with the source of creation." At age 18, Damien Echols was sentenced to death for a crime he didn't commit. "I spent my years in prison training to be a true magician," he recalls. "I used magick--the practice of reshaping reality through our intention and will--to stave off incredible pain, despair, and isolation. But the most amazing feat of all that practice and study was to manifest my freedom." 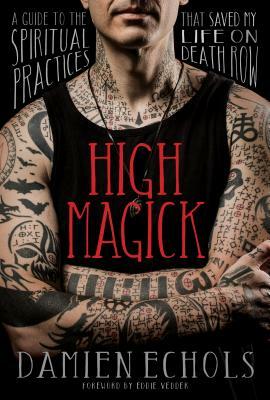 With High Magick, this bestselling author shares his first teaching book on the powerful spiritual techniques that helped him survive and transcend his ordeal on death row. - What is High Magick? Damien clears away the stigma and reveals the history and core teachings of this extraordinary art. - The Four-Fold Breath--a foundational meditation practice to train your mind and body to channel subtle energies. - The Middle Pillar--how to bring divine energy into the central channel of your body for empowerment and healing. - The Qabalistic Cross--a centering technique to help you stay balanced and protected regardless of circumstances. - The Lesser Rituals of the Pentagram--powerful practices for banishing negative energies and invoking energy to manifest your goals. - Working with angelic beings and other spiritual allies to support your practice. - Creating thoughtforms to assist you in your ongoing magickal development. - Guidance for overcoming your doubts, enhancing your visualization skills, creating talismans, practicing magick ethically, and much more. "Magick is a journey," writes Damien. "It's a continuously unfolding path that has no end. You can study and practice magick for the rest of your life and you will still never learn everything that it has to teach you." If you're ready to discover your untapped potential for co-creating your reality with the energy of the divine, then join this extraordinary teacher to begin your training in High Magick. Damien EcholsDAMIEN ECHOLS was born in 1974 and grew up in Mississippi, Tennessee, Maryland, Oregon, Texas, Louisiana, and Arkansas. When he was 18, Damien and two other young men were wrongfully convicted of murder, eventually becoming known as the West Memphis Three. Having received a death sentence, Damien spent almost two decades on death row, until he was released in 2011. While in prison, Damien was ordained into the Rinzai Zen Buddhist tradition. He is the subject of Paradise Lost, a three-part documentary series produced by HBO, and West of Memphis, a documentary produced by Peter Jackson and Fran Walsh. Damien is also the author of the New York Times bestseller Life After Death, Yours For Eternity (with his wife Lorri Davis), and High Magick. Damien teaches classes on magick around the country and works as a visual artist. His artwork entails glyphs, sigils, and symbols designed to bypass the conscious mind and speak directly to the subconscious, combining magick techniques with his own alphabet and writing system to break down concepts and scenarios into abstract designs. He and Lorri live in New York City with their three cats. For more, visit damienechols.com.